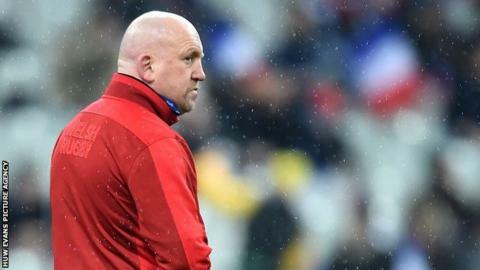 Incoming Wales coach Wayne Pivac says a replacement for defence coach Shaun Edwards has already been appointed. Head coach Warren Gatland and the current Wales coaching team step down after the World Cup this autumn, when Scarlets boss Pivac takes over. Pivac said talks took place in August about Edwards staying with Wales. "Shaun was the first person I spoke with. He indicated he was under pressure from Wigan and that the timeline was unrealistic," he said. "We have finished the process and we have recruited a defence coach and that will come out in due course, hopefully." Rugby League podcast - What's happening at Wigan? Edwards has been acknowledged as a key architect of Wales' 2019 Six Nations Grand Slam, with the team conceding only seven tries in five matches. However the former rugby league international revealed after Wales' decisive 25-7 win over Ireland that he was still a free agent after the World Cup and had not in fact agreed to join rugby league giants Wigan. "I haven't signed a contract with anybody yet," the 52-year-old said. Pivac said he had been surprised by the stories that emerged after Wales' Grand Slam win. "Shaun knew he was on the [Wales] shortlist, that he was the incumbent. We'd had a meeting and subsequent conversations," said the New Zealander. "It's between Shaun and Wigan. I have no control over that. I only know about the discussions we had way back in August. "Shaun has done a fantastic job - we all know that. He's a very, very good defence coach."